The first trailer and poster for Anna Karenina, along with a second more theatrical poster, have given a Baz Luhrmann sort of vibe to Joe Wright's new period romance featuring his Pride & Prejudice star Keira Knightley. The film promises "a bold new version of the epic story of love," and I don't remember posters for romances like this being so striking. 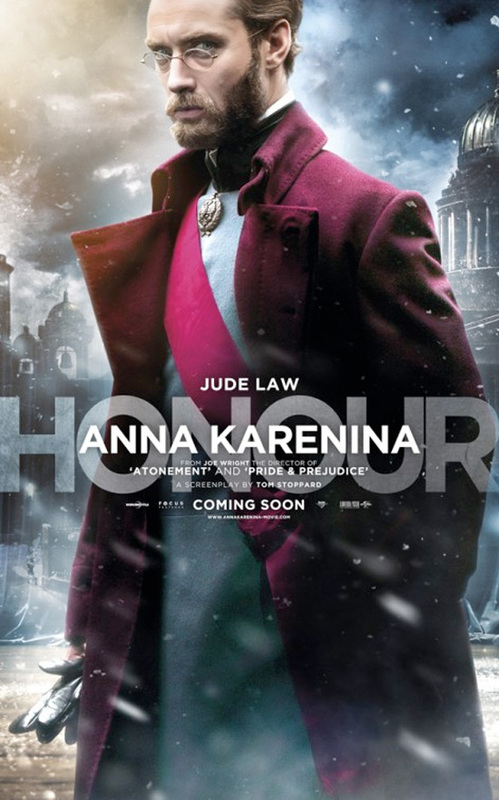 Even these three new character posters for Anna Karenina are simple, but promise something fantastical and theatrical (in the sense of a stage play) style to the story. Aaron Johnson and Jude Law get their own posters with Knightley, each with desire, passion and honor. The third collaboration of Keira Knightley with director Joe Wright, following both Pride & Prejudice and Atonement previously, is the epic love story Anna Karenina, adapted from Leo Tolstoy's classic novel by Academy Award winner Tom Stoppard (Shakespeare in Love). The story unfolds in its original late-19th-century Russia high-society setting and powerfully explores the capacity for love that surges through the human heart, from the passion between adulterers to the bond between a mother and her children. As Anna questions her happiness, change comes to her family, friends, and community. Focus Features is sending the film to theaters in the UK on September 7th and right here in the US on November 9th. Interested? i anticipate they were going for a 'mysteriously distant and sultry' look with the Knightley poster, but have ended up with 'dragged through a hedge backwards while pouting inanely.' Law's is much better, as you have to look twice to see it's him, so you already have some intrigue. overall, with the swirling snow and Tsarist backdrops, they're heavily selling a sort of Dr Zhivago epic romance with these. I like her inane pouting. i had hoped a russian story with russian characters speaking russian was portrayed as such. the only rationale i could come up with them being british speaking english was that the cast and crew were all brits....that aside, i hope its good.